Reflexology: Different points or areas on the feet or hands are worked to encourage the body towards a state of balance and self-healing. This 30-minute treatment focuses in on providing a sense of calm, wellbeing and balance. Back, neck and shoulder massage: This 30 minute treatment is a mixture of relaxation and firm-pressure (deep tissue work) which is designed to release tight layers of muscle and tissue, helping to restore movement and alleviating any pain, tightness or spasm in a problematic area. Hot stone reflexology: An innovative treatment that combines the effectiveness of a standard reflexology treatment with the comforting warmth of hot basalt stones. This treatment uses the heat to penetrate deeply into the reflex points. 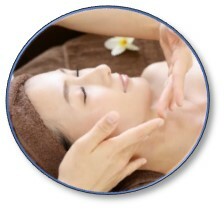 This 30 minute treatment will focus on deep relaxation and balance. Facial Rejuvenation: a dynamic form of facial massage performed using natural and organic products primarily aimed at addressing facial tone by lifting and draining the facial tissues using specialised massage techniques. This treatment not only helps to reduce puffiness and flaccidity and define the facial contours, but helps improve skin texture and tone. Despite the dynamic nature of the massage the treatment is deeply relaxing. Pre-blended organic rose or frankincense facial oils together with soothing quartz crystal balls are used to perform this treatment.